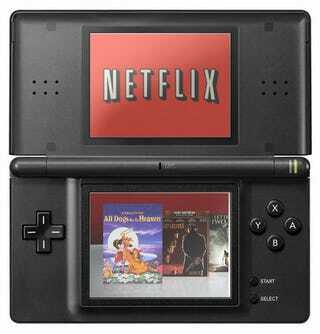 How likely would someone in your household be to stream TV and movies from Netflix to a Nintendo DS, should such functionality be made available? That's the question Netflix is seeking an answer to via an online survey. Would you watch? With a plethora of HD video capable portable devices at my fingertips, the Nintendo DS is probably the last handheld I would consider watching streaming video on, but that's just me. A Netflix survey looks to be testing the non-Fahey consumer population to see if they'd like to give DS video streaming a go. SO it's basically the same sort of functionality already available on the Xbox 360 and PlayStation 3, only smaller. Netflix also notes that your DS must be connected to a Wi-Fi network in order to stream content, but that's for the folks who still believe TV transmissions are magic. What do you folks think? Would you watch streaming video on your Nintendo DS, or are those screens too tiny for your tastes? Thanks to Kevin for passing along this story.